The center of Beijing (Peking) is characterized by two architectonic elements which date back, respectively, to Imperial and Communist China: the Forbidden City and Tienanmen Square. These confining elements are separated by the walls protecting the ancient Imperial headquarters. A series of regularly distanced benches runs along the walls’ perimeter on the side overlooking the Square. This borderline and transitional location, between the Square and the palace, caught the photographer’s attention. The photographs by Emanuele Nappini narrate, within a series of portraits, the daily spectacle that takes place along this boundary. The benches are occupied by a variegated class of characters: tourists, couples, families, students, passers-by. 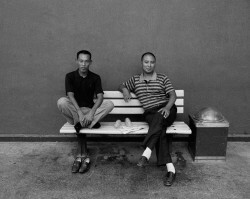 The photographer’s eye traces, in phenomenological manner, the act of temporary occupation of a location by capturing gestures, expressions, postures, and by revealing the spatial and relational connections defined in each photograph by the bodies occupying the benches. Through a rigorous and programmatic mise en scene (same framing, same relationship between the figures and the background) what emerges is the nature of a population, the Chinese, during its moments of pause, relaxation and joy. The country we observe in these images is a Minor, yet not minority, China: a multi-ethnic China which, for just a few seconds, minutes or hours, ceases being the laborious and crowded, aggressive and ambitious country, and becomes simply China during a break. Emanuele Nappini does not represent the masses, their existence as multitudes, but prefers to isolate elements of such masses in order to show them to us in greater detail, while revealing relational dynamics which do certainly not appear too distant from those we are familiar with. The author’s photographic research is not limited to the scene and its protagonists: in capturing certain postures and expressions, certain forms drawn by bodies and environments within the frame, the photographer appears to evoke a possible nature of behind-the-scenes activity, revealing similitudes and assonances. As in the case of the two huddled up young people, probably students, who, disposed in an emisymmetric position, appear to unintentionally form the Taijitu or Tao which synthesizes the two principles of opposition, the yin and the yang, fullness and emptiness, that are central in Chinese philosophical culture. Indeed the photographer appears to apply his compositional attention precisely to the concepts of emptiness and fullness, by arranging everything in balanced fashion, so that clear, orderly and harmonic power lines may emerge. The portrayed subjects interact with the photographer, and, in turn, with the spectator. Their will to create a dialogue with the author and with people who will view the images is evident, as in the case of the girl from the extended family which crowds the first photograph, who appears to want to send us a greeting and her best wishes, with a gesture that is common to many populations: the index and medium finger of her hand are held apart and form a V meaning peace. Thus these works by Emanuele Nappini appear to refuse the representation of China as a world of extremes, of speed and sensational images, in order to lead us back to a more fragile, delicate and distracted China, where the center of our attention is dedicated to a humanity which, while seated on benches, observes the world and us. Silver Gelatine Print, 18 x 24 cm. Limited edition. Price on request.